The Countdown of Doom is a 1-room puzzle/combat encounter. The PCs enter a square room 50 feet on a side. There are two doors, bisecting the walls on opposite sides. Against one unbroken wall, a massive demonic statue looms, 20 feet tall, carved in excruciating detail. A pedestal stands in front of the statue with an hourglass floating above it. An easily visible pressure switch is on the top of the pedestal. An examination of the statue shows it to be extremely life-like, with an almost palpable sensation of hate coming off it. Detect magic reveals a strong aura of conjuration and abjuration. Attempts to destroy the statue are ineffective. Across the room from the statue is a silver circle inlaid into the stone floor, 10 feet across. When one of the conditions above are true, the encounter begins. The doors seal shut with walls of force, trapping the players inside. The hourglass fills with glowing sand and starts draining. It appears that the hourglass will run out in 30 seconds. Pressing the button on the pedestal flips the hourglass and resets it to 30 seconds again, as well as summons a demon in the summoning circle. Every time that the hourglass is reset, new demons spawn, gradually increasing the difficulty of the fights. This should be an incremental challenge rating increase. For example, if the player party has an average encounter of CR 5, start the first demon at CR3. Then 2 demons of CR2, then a CR4, then two demons at CR3, etc., making each round of summons gradually more and more difficult to kill. If the players let the hourglass run out without touching the button, you can either move on to the end of the encounter, or have the statue come to life. The encounter ends when the players let the hourglass run out. If the players are still healthy with lots of resources, let them finish killing the existing demons. If they’re just about dead, have the demons unsummon. When the last demon is gone, the wall of force blocking the doors dissipates and the players can move on. You can provide a reward either by summoning a chest in the silver circle or loot in the next room or however else fits the dungeon best. Obviously, this encounter runs best when the players are afraid the demon statue might be coming to life. Playing up the realism of the statue, the sense of dread coming from it, and that sort of thing will make the players afraid of the statue coming to life and make them want to “buy time” by resetting the hourglass to try and figure out how to defuse the countdown. Having other statues come to life earlier in the dungeon will reinforce this, or perhaps having a basilisk or gorgon in the area. Keep in mind that this sort of repeated summoning of monsters can quickly get out of hand. The objective is to provide a hard encounter, perhaps deadly, but not to wipe out the players. If the players seem to be getting overwhelmed, tone back the difficulty of the summoned monsters. 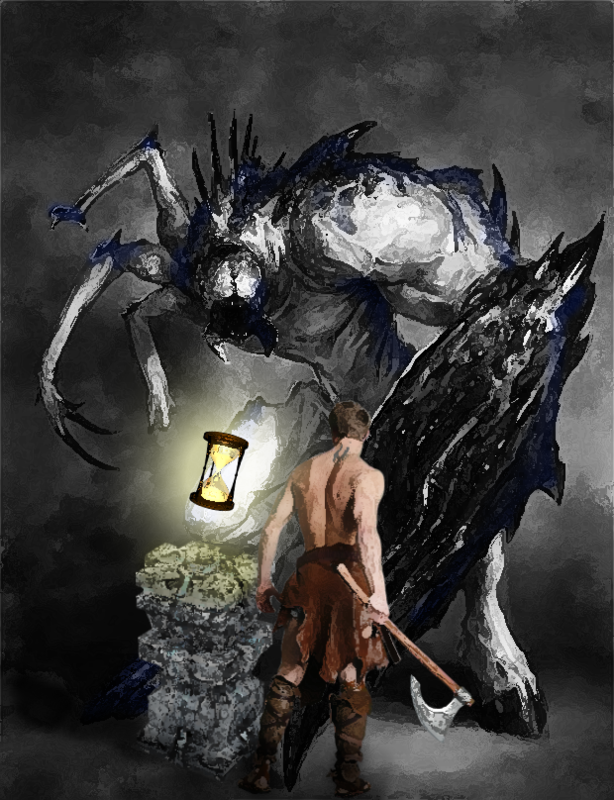 I ran this encounter with demons, as it fit the theme of my dungeon at the time. However, you can do it with essentially anything. The primary elements are the big threat of the statue, the timer, and escalating combat difficulty. The exact nature of the monsters represented can be as varied as you like.